The North Bay Golf and Country Club is proud to registered for Patriot Golf Day for the 2013 golf season. The PGA of Canada would like to thank you for participating and supporting our first annual Patriot Golf Day in support of Canadian military members and their families. 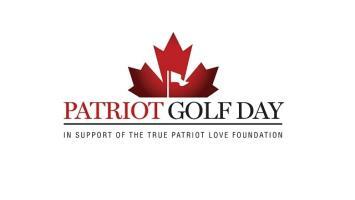 We are extremely proud to yet again be partnering with our friends at Golf Canada and the True Patriot Love Foundation for this year’s Patriot Golf Day Canada. This year’s events will begin on June 24th at the PGA Championship of Canada, and will take place across Canada for the entire month of July—ending on the close of the RBC Canadian Open on July 28th. Your support last year was a great jump start to Patriot Golf Day and the month-long grass roots initiative. This year we hope to have over 50 golf facilities across the country take part and raise over $50,000 for the True Patriot Love Foundation, with the optimism of expanding our reach even further. We wanted to personally thank you and ask if it would be beneficial for you to participate in this amazing cause again this year. It would be an honor to have your partnership, yet again, in raising funds for a variety of military programs, local communities, and charities across Canada. For more information and to register your facility, please visit www.pgaofcanada.com/patriotgolfdaycanada/.